On Monday, you shared your stories of offline political activism in Things We Did This Week, addisnana was Keeping the Corn in Christmas in Midday Matinee, and winterbanyan reported on the Results of Shrinking Arctic Ice in Our Earth. On Tuesday, the Squirrel mused On ‘Miracle’ Comebacks in Morning Feature and readers helped tell Tuesday’s Tale: North Pole One in Midday Matinee. On Wednesday, the Squirrel saw The Rise of the Malcontents in Morning Feature and addisnana shared thoughts on Abusive Priests in Midday Matinee. On Thursday, we began a series on A Year of Media Failure with ScandalFest 2013 in Morning Feature and triciawyse shared Fursdai Furries in Midday Matinee. On Friday, we continued our series on A Year of Media Failure with Broken News in Morning Feature and triciawyse brought us Frieday Critters in Midday Matinee. On the weekend, we concluded our series on A Year of Media Failure with Fire Somebody … Except Us in Saturday’s Morning Feature, the resident faculty and staff celebrated The Fourth Annual Squirrelidays! in Sunday’s Morning Feature, and winterbanyan brought our weekly Eco News Roundup in Our Earth. Thus note left outside the mail room by the resident faculty, as they made their way from the wine cellar library where they spent the weekend drinking thinking on our motto of Magis vinum, magis verum (“More wine, more truth”) to the hot tub faculty lounge for their weekly game where the underwear goes flying planning conference. 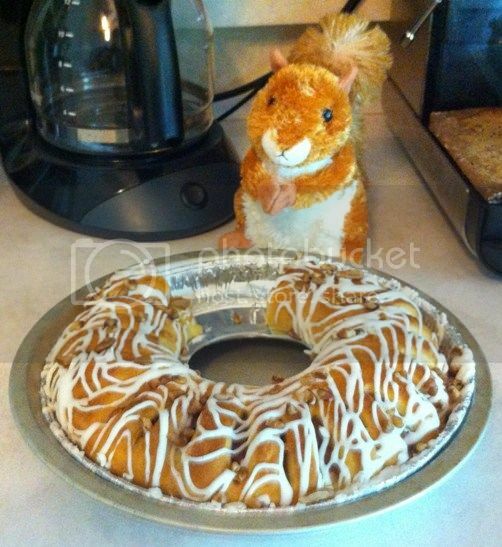 Chef asked what he meant, and the Squirrel eyed the pecan danish ring. “Actually the resident faculty are taking the week off for the holidays,” he texted. “Greek myths?” the Professor of Astrology Janitor asked. “This wouldn’t be a bit of self-promotion during the Squirrelidays, would it?” Chef asked, her voice tinged with disbelief. “I’m sure I’ll understand that later this week,” Chef said. Chef better stock up on those pecan danish rings…. I have heard Kate DiCamillo interviewed on MPR. She is engaging and has a great laugh! My summer boss has a daughter a year older than my granddaughter. When my granddaughter was visiting and we were heading into the library I asked him for recommendations. He said, “Anything by Kate DiCamillo.” What a find! I love how word of mouth brings a writer from one reader to the next. 🙂 A heroic squirrel is perfect. A heroic squirrel is perfect. Thanks. I feel like I’m getting a present.